You could say that Joye has lagged behind a little bit in improving the electronic cigarette battery that so many others have imitated. While others have created new variations on the eGo style battery in terms of form and function, Joye has seemingly concentrated more on the atomizer and juice feed systems. 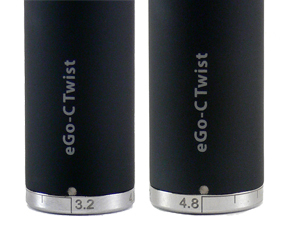 The variable voltage eGo-C Twist is a welcome change in that trend. Naming the new batteries with the eGo-C prefix may be a little misleading to some, as the batteries are completely compatible with the whole range of eGo accessories, not just the eGo-C line of atomizers. We’ll call it the Twist for short. There have been some previous variable voltage eGo style batteries from other manufacturers, but these have limited to delivering the maximum 4.2 volts of the internal battery. The Twist breaks new ground by incorporating a buck boost converter that delivers anywhere from 3.2v to 4.8v. All of this in an only slightly longer eGo electronic cigarette battery. The length of our 650mAh is 10mm, or 3mm longer than a standard 650mAh eGo. Setting the voltage couldn’t be simpler. The base of the Twist is actually a dial with engraved markings representing .2 volt increments. A dot on the bottom of the tube indicates where the voltage is set. This dot lines up with the model designation on the body as well as the button. The other end of the battery is standard eGo design, with 510 inner threads and eGo threads outside. The button is also the same and powers the device as well as providing 5-click on’off protection. The batteries are compatible with standard eGo chargers as well. The eGo Twist delivers impressive performance from such a small package. As expected, there is a limitation to the amps that can be delivered, but a good 4.2v is delivered even with a 2.0ohm cartomizer attached. The full 4.8v is reached with a carto measuring 2.8ohm. In fact, the measurements under load with the 2.8ohm cartomizer were exactly what the dial was set to. Pretty impressive. We haven’t tested this unit long enough to see how long the battery lasts, but it appears to be similar to a standard eGo and the lack of extra warmth from the booster means that it is operating pretty efficiently. One notable change from other eGo-C batteries is that there is no indication that the battery is getting low. Like earlier eGo batteries, when it’s out of power it just quits, with the button blinking to let you know what happened. 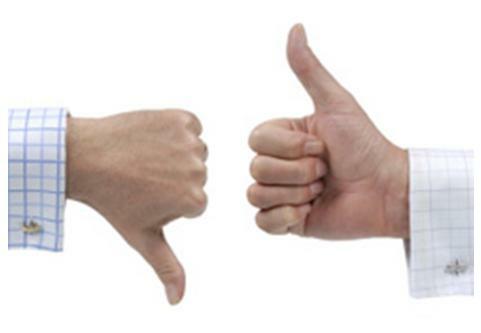 Electronic cigarette users who have become accustom to the eGo form factor no longer have to step up to a larger advanced personal vaporizer to enjoy some of the pleasure of variable voltage. The Twist won’t keep up with the big boys when it comes to maximum voltage delivery, but in terms of size, it has them all beat. At less than $30, the Twist is expensive compared to other eGo batteries, but it is one of the least expensive variable voltage alternatives available. 650mAh and 1000mAh models are currently available from Litecig and Cignot.